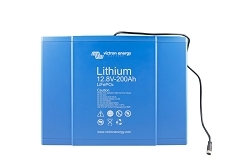 I have a single 200 Amp Hour Lithium Iron Phosphate Smart Battery from Victron Energy. It is called a smart battery because it has built in Bluetooth and you can talk to it using your phone, even before you open the packing crate it comes in. You need a battery switch so you can turn off the system if there is a malfunction, if you want to work on it without it being live, or if you want to put it away in storage without having to worry about it. I'm using a Blue Sea 6006 battery switch which has a continuous rating of 300 Amps, same rating as the fuse on the battery terminal. I've taken a tap off the battery side of the battery switch for my "always on" circuits. More about this later. The purpose of circuit protection is to protect the wire, so the circuit protection goes at the power source and is to match the wire size. Where you drop down a wire size additional circuit protection is needed to match the smaller wire. I have used a Blue Sea 5045 fuse block for my "always on" circuits and each has a 2 Amp fuse. My "always on" circuits are the BMS (Battery Management System) and the BMV Meter. I want the BMS to be always on because otherwise the system wont automatically restart when AC power is provided. I want the BMV Meter to be always on because if it went off and was turned back on it would assume the battery was full, even if it wasn't. If I ever want to put the battery in storage for an extended time I will remove the fuse from these two items, because even very small loads like these will in time run the battery down. 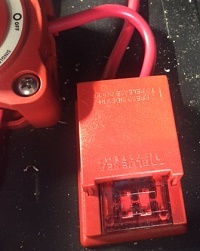 I have a Blue Sea 5006 fuse block with a 50 Amp fuse going to the Battery Protect and then a Blue Sea 5035 fuse block for the various other circuits. The Battery Protect is rated up to 65 Amps but I don't anticipate needing more power than can be carried by the 50 Amp fuse. 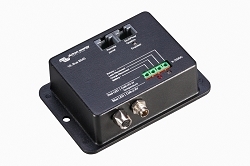 I will use 8 awg wire which has an ampacity of 80 Amps. 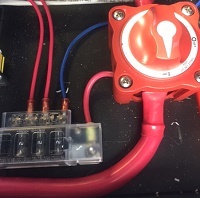 Here is a link to the Ampacity Tables Note I am using marine gauge wire with an insulation rating of 105 deg C.
This is what the inside of the MultiPlus looks like. They have double terminals for battery positive and negative in case you want to double up on those cables. To the left of those connections are the AC input and output. Above them are the two VE Bus ports. Along the bottom row is a bunch of smaller connections that we aren't using in this installation. A temperature sensor comes with the MultiPlus but we aren't using it in this installation because the battery has its own sensor built in. 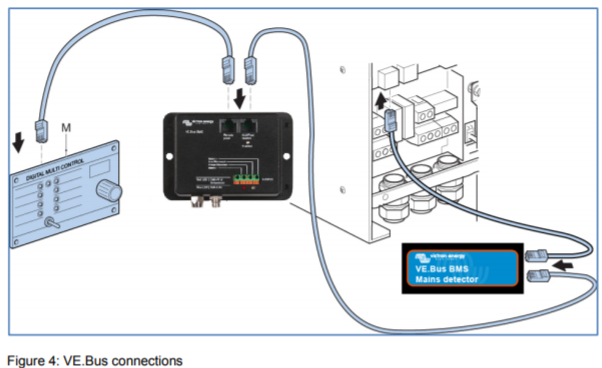 The purpose of the VE Bus Mains Detector is to wake the system up if it has been shut down for undervoltage. 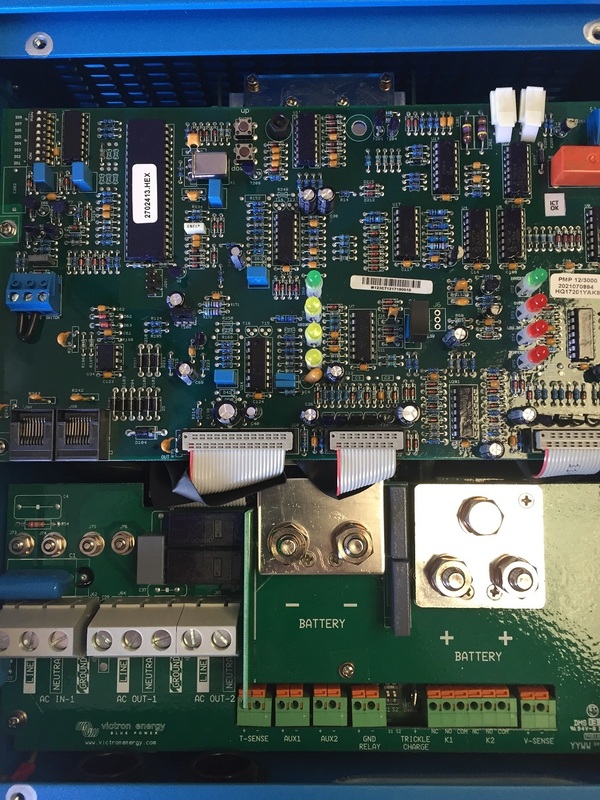 Even the switch circuit on the MultiPlus uses a tiny bit of power and in the event of a low voltage shutdown even the tiny amount it uses could over time run the battery past its point of no return. So when the BMS shuts down the system it also shuts down the switch. The mains detector wakes it all up again. 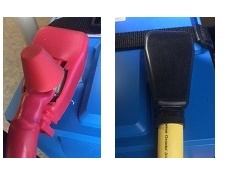 It comes with some Velcro so you can attach it to the underside of the MultiPlus and it connects into the VE Bus cable. In my system I have a VE Bus cable going direct from the MultiPlus to the Color Control GX and another going from the MultiPlus to the VE Bus Mains Detector and then to the BMS. Discharge threshold 5% (default was 50%) This sets the level of discharge that the 'time to go' counter counts to. We also reduced the max allowable charge current so as not to blow any circuit breakers at the boat show. For multiple batteries charge each one individually first before connecting them together. This parts list is a bit particular to my demo situation. In a real life situation some of the parts would probably be beefed up a bit. As well as the list above I have some assorted lights and a phone charger USB port to use as my demo loads. And of course as my AC load I have my Victron Energy sign! I corrected this drawing, the original version had a Cyrix between the solar panels and the battery. It turned out that didnt work and now there is a Battery Protect. I also made a correction to the drawing and removed the negative connection to the BMS. 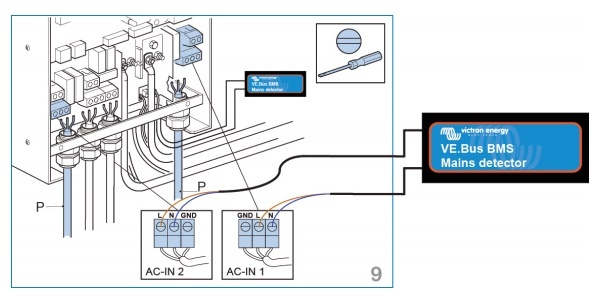 Because the VE Bus has a negative connection, and because we dont want two negative connections, we dont use the negative terminal of the BMS when a multiplus is connected. Its there in the manual somehere. Since I wrote this post I realize I made a mistake and used the Cyrix-Li-Charge to shut off the solar load when the battery is full. This was a mistake, it doesn't work in this particular application and I should have shown a Battery Protect instead. The Color Control cannot control the MPPT, I dont know why, it just cant. Hi Peter, another question, why doesn't the Cyrix-Li-CT do the job? Any advantage to use a BP instead? 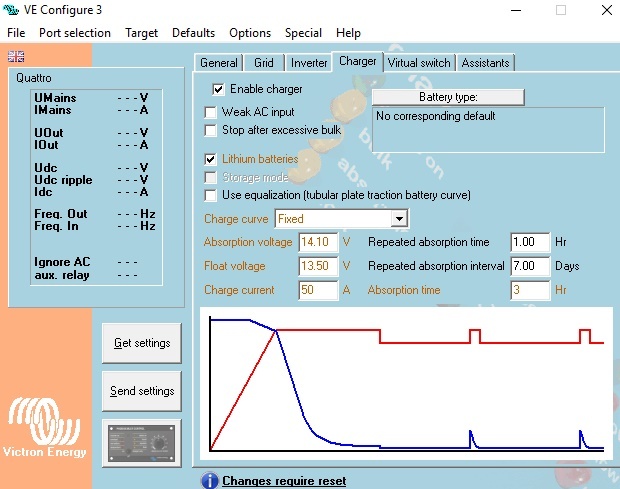 Hi Peter, in this blog post you are using a BP to protect the lithium batteries against over charge. 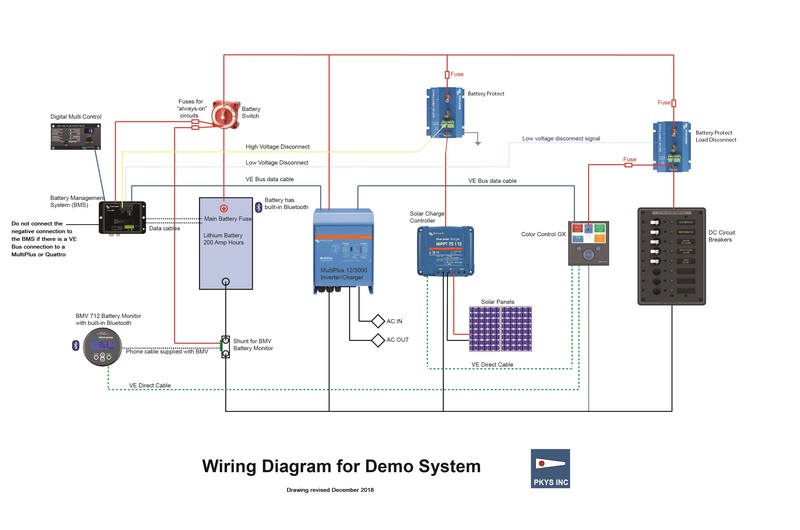 In your other post (https://shop.pkys.com/Demo-24V-System-wiring-diagram.html) the MPPT Solar Charge Controller is connected without a BP... Which one is the right solution? 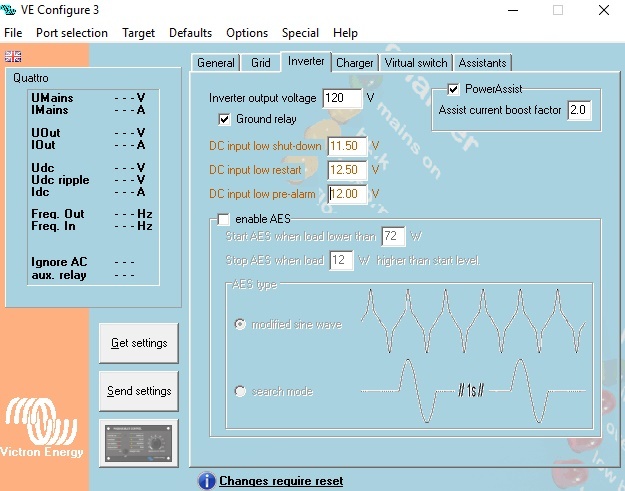 Can the MPPT be controlled through VE.Direct to switch it off in the event of maximum cell voltage? You are stating it can´t, but the other schematics implies it can... Please enlighten me on this, since I´m planning a Lithium/MPPT System with a CCGX. Thanks a lot, Martin. When using a Lithium Battery you need some way to shut off the charge. Because the VE Direct port of the MPPT is in use for something else we cant shut it off that way, so the Battery Protect is used instead. In the other drawing you refer to we are not using a Lithium Battery, it shows just a conventional AGM battery, so we dont need that extra level of security. 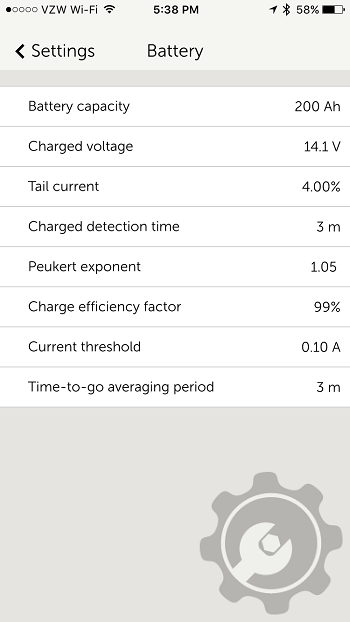 The MPPT is a three stage charger and so it wont overcharge the battery.